Willow Picnic Basket for 2Content:2 ceramic plates (8") 2 wine glasses 2 Ea.kniv..
Willow picnic basket with deluxe for 2. With cotton lining and made of willow and wood,this new shap.. The Classique Elite Basket Picnic Basket with three BBQ tools and service for two with large insula..
Willow picnic basket with deluxe for 4. With cotton lining and made of willow seagrass and wood chip..
Willow picnic basket with deluxe for 4. With cotton lining and made of willow and wood,this new shap.. The Estate Basket Willow Picnic Basket for TwoContent:2 Sets Of S/S Flatware 2 Ceramic.. The Estate Elite Basket Willow picnic basket for four with insulated cooler compartment and cutlery..
Willow picnic basket with deluxe for 4. With double lid open,cotton lining and made of willow seagra.. The Terazzo Basket Willow picnic basket with service for four; large insulated food compartment .. 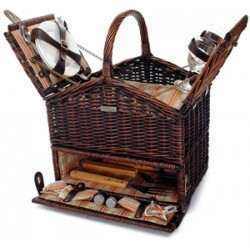 The Tuscan Carrier Deluxe Willow picnic basket for four with three BBQ tools and wine bottle holder.. The Tuscan Elite Basket Deluxe willow picnic basket for four with three BBQ tools, mit, waterproof ..
Willow Picnic Basket for 2 Content:2 ceramic plates (8") 2 wine glasses 2 Ea.knives..
Willow Picnic Basket for 2 "NEW"